Thinking about getting an alcohol stove? It’s a great, lightweight option. The problem is, there a ton of lies, rumors, and myths surrounding the use of alcohol stoves. So it can be hard to figure out whether it will make a good addition to your gear. Well, after you read this that won’t be a problem for you. Because you’ll know exactly what’s true and what’s a lie. That way you can easily make an informed decision. When you try to choose the correct stove for your backpacking trip, there are so many options! Lots of people do not know about one choice, the alcohol stove, which is a lightweight and super cheap option as you head out for your adventure. There are a lot of lies and lies about the alcohol stove, so make sure that you understand their pros and cons before making your stove choice. You might not know much about the alcohol stove, because it’s not the kind of stove you see in backpacking magazines or in most stores. Since they are cheap, it’s hard to make money off of them, so a lot of companies don’t like to advertise the alcohol stove. Some people might even say that the alcohol stove is dangerous, but that’s only true if you misuse it or don’t know how to set it up properly. If you do a little training, you can make sure to have a safe and easy-to-use fuel source when you start off on your adventure. 10 10) The best alcohol stove is made from a penny can. The first lie is that alcohol stoves don’t work, which is completely untrue! However, they are best used in three season weather and not winter conditions: you also can’t cook a huge amount of food with an alcohol stove, so don’t use one if you have grand plans of making elaborate meals. Sometimes if you need to hike with a bunch of people, you might want to get a more heavy duty stove. The best case for using an alcohol stove is a backpacking adventure when weight really matters, but you might not want to use one for a car or rafting trip when you can add on more weight. Think about your priorities before you decide on the stove. Another thing to keep in mind is that alcohol stoves do not cook as quickly, since they need time to heat up. If you like to have morning tea or coffee before heading out on a hike, you might be disappointed by the sheer amount of time it takes to heat up water. It’s best to use an alcohol stove if you plan to use it mostly in the evenings when you are not in a rush. The next lie is that alcohol stoves are not reliable, which is completely false: many thru-hikers carry them for thousands of miles at once. Check out different books on hiking and see what stoves people chose. According to the book Long-Distance Hiking, by Roland Mueser, the alcohol stove was actually the only stove used by hikers on the Appalachian Trail that had a failure rate of 0%. Even the more expensive and fancy stoves had higher failure rates than that. On a similar note, it’s not such a big deal if your alcohol stove does get broken. It is easy to replace them with parts from a local hardware store, so you should not have to panic about possibly letting your stove get broken. The next lie is that alcohol stoves are dangerous, which has a grain of truth: every stove is dangerous if you do not know how to use it properly. Make sure to handle the fuel carefully and follow these basic safety rules: cook on a surface that isn’t flammable, keep water on hand to put out fires, be mindful of the nearly invisible flame, watch out for wind, keep the stove outside your tent, and get proper ventilation. Don’t cook on any kind of surface that can catch fire. Make sure there are no flammable materials near your stove or in the cooking area when it’s lit. Make sure that you have a full bottle of water nearby as your emergency fire extinguisher. In the light, you will have a tough time seeing a flame from the alcohol stove, so make sure not to burn yourself. Always make sure that you think about the weather conditions. If you see a lot of wind and cannot control the flame, do not use the stove. Don’t add fuel to a stove that’s already burning, because there might be flare-ups or some other problem with the flame. Never use your stove in your tent, because you may not get enough ventilation and you might set things on fire. In general, do not use your stove in an enclosed area without ventilation. Never leave a burning stove unattended, even for a second. You never know what can happen in a few seconds, and it is just not worth the risk. Alcohol stoves get hot. Once you blow out the flame, wait a few minutes for the stove to cool before you handle it or put it away. Actually, an alcohol stove can get crushed easily, which means that you need to treat it carefully during your hike. Store an alcohol stove in a hard carrying case to keep it safe. You can also think about making your stove out of a more study kind of can, like a cat food can, instead of a soda can which is a little more flimsy. The next lie is that alcohol stoves don’t work at high altitudes, which is also false. People have used these stoves as high as 12,000 feet above sea level, which definitely makes the cut for high altitude! For practical purposes, using a stove a high altitude is just fine. However, keep in mind that alcohol stoves do not work best in snow conditions. That is because it is a small stove, so you cannot quickly melt snow and use it for water. The size of the alcohol stove is the problem here, but not the concept of the alcohol stove itself. Just to be clear, an alcohol stove will perform just as well at a high temperature in terms of burning efficiently, but the size and cooking ability may not meet your needs. If you are often climbing into snowy territories, think about another kind of stove that you could use. Another lie is that alcohol stoves do not work in low temperatures, which is also false – they are not very practical for melting large pots of snow, but the stove itself will take longer to get warm and head up your food. People have used alcohol stoves in temperatures far below freezing, and they were even popular for the Swede and Finnish armies, who use these stoves all year in very cold temperatures. The best strategy is to think about how practical it is to bring an alcohol stove with you in the winter. It takes a lot of heat energy to melt snow, and you know that an alcohol stove does not have the largest or hottest flame. That means you will have to spend more time and fuel on melting snow, which might not be how you want to spend your evenings. There is another important thing to keep in mind as you make your choice about an alcohol stove. At very cold temperatures, it can be difficult to get the stove going. That is because of the chemical properties of alcohol. Since alcohol does not vaporize as easily in cold weather, and because the alcohol is what you set on fire in order to cook things with your stove, you may have some trouble getting your stove running in cold temperatures. Other people keep a little extra fuel in a bottle inside their jackets, which means that the fuel is warm and ready to go when you want to cook. The only problem here is that you might forget what is in your pocket and spill it, or accidentally get it all over your clothes and create a fire hazard. Instead, you can take some time to warm the alcohol before starting to heat up your stove at night, which should help you get cooking faster. The bottom line is to think about your weather conditions as you make the right choice for your heating needs. There is a little truth to the claim that you can’t simmer water evenly with an alcohol stove, but if you are careful and use a simmer ring, you can keep water at a more stable temperature. When you put a simmer ring on top of your alcohol stove, you will be able to even out the flame a little bit more, but it is still not the most precise method. Some people actually have several different simmer rings, so they can control the flame in different ways as they cook. This can be helpful if you are trying to make a more fancy meal, but for people who just need to boil water, there is not much of a reason to carry the extra weight of several simmer rings. Again, think about whether you need to be able to simmer water while you’re hiking, and then think about whether an alcohol stove can meet your needs. Another half-truth is that the weight of fuel makes an alcohol stove heavy to carry, but this is simplifying the story too much. It’s easy to bring a little bottle with alcohol for your stove, which can weigh less than a whole fuel can for a larger stove. However, some people are on the trail for a number of days at a time, so it can be heavier to start off carrying an alcohol stove. But think about the ounce for ounce weight of an alcohol stove versus a gas stove: you’ll use more of the alcohol fuel, so the fuel will weigh less, and the alcohol stove itself is lighter. The basic truth about an alcohol stove is that it does not burn as hot as a traditional stove, so you will in fact have to spend some time packing in more fuel to use. There’s more to the debate than this, though. When you go on the trail for a weekend, you should probably take just a little bottle of fuel and save the extra weight. Compare this weight to the traditional fuel cans that most stoves use, and you will be surprised by home much they weigh, even empty! The best part of taking just a little bit of fuel on a short trip is that you can put it in a lightweight bottle and not have to lug heavy metal cans around with you. If instead you decide to go out for a longer trip, you will have to be careful about the amount of fuel that you bring. You will need to bring a lot more fuel up front for your alcohol stove, but you will use it up faster than you would use up fuel for a traditional stove. In the end, that means you will go through the fuel at a similar pace and end up with the same weight at the end of the trip. Because of this, you should think about the weight of other stove parts so you can make an informed decision. Since an alcohol stove is so lightweight and made from such light metal material, it is usually lighter than other stove options, making it a great choice when you go on a long trip. You can also spend some time thinking about how much fuel you use per day in ounces. By figuring out how much you actually have to take with you, you can best pack and prepare for the trip ahead. Some people use an ounce every day; others need several ounces a day and use their stove for most meals. No matter what your eating habits are, leaning what they are can help you prepare. Essentially, you’ll have to make your own decision about the stove that works for you: think about the distance you are trying to reach and how much to carry. Another lie is that a Pepsi can makes the best alcohol stove, but this is untrue. Any can with a stable bottom can hold up well as an alcohol stove. Some hikers debate about what exactly makes the best alcohol stove, but these debates are not particularly important. The key thing to look at when you choose a can for the alcohol stove is the bottom of the can. You want to look for a can that has the circular crease on the bottom, because these cans are the most stable and stay together under heat and pressure, which are exactly the conditions you might expect from an alcohol stove. You don’t even have to use a soda can if there are other types of cans that you prefer. 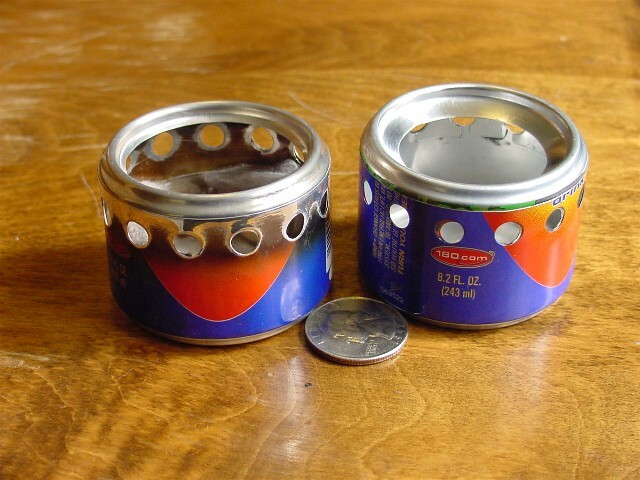 As long as the can will hold its shape well and stay stable during the fire, you should be able to use it for your alcohol stove. 10) The best alcohol stove is made from a penny can. One lie that comes up often is that penny can stoves are the best type of alcohol stove, which can be true for some people. It’s a little harder to get a penny can stove started, but they are reliable once you learn how they work. A penny can stove is pressurized, more so than other alcohol stoves, and the penny works to vent pressure out so the stove does not explode. That is a little more complicated than other alcohol stoves, which is why some people think they function better than any typical can. No matter how helpful the penny is, the stove itself burns about as hot and as quickly as a typical alcohol stove. The other thing to realize about penny can stoves is that they take a little more time to set up than traditional alcohol stoves. You have to prime them and get them started slowly, which can be a little too complicated for hikers who want a quick dinner on the trail. Try setting up a penny can stove and seeing if the process works for you. Another half truth is that you do not need a pot stand for a soda can stove. This can be true depending on your stove setup, but most of the time you might want to think about a stove stand. It’s easy to smother the flame if you are not careful with airflow. This is an important point if you want to cook a lot of things that aren’t just water. Heating up water is easy and simple enough to do using an alcohol stove, but it is more difficult to cook heavier meals on top of an alcohol stove. If you do plan to do a lot of heavy cooking, you might want to look up a stove design that separates the support for your pot and the flame itself. These pot stands are not very expensive, and they can go a long way to helping you make a delicious meal on the trail. If you just want a quick way to boil small amounts of water, you will be fine with an alcohol stove. Now that you know all about the alcohol stove, it’s time for you to think about the kind of stove that best suits your needs. If you need something lightweight and aren’t planning to make a lot of complicated meals, the alcohol stove can help you cut down on weight and still boil water. If you have other preferences, see if an alcohol stove can actually be better for your next trip: make sure you’ve gone through these lies so you know the truth about the alcohol stove!